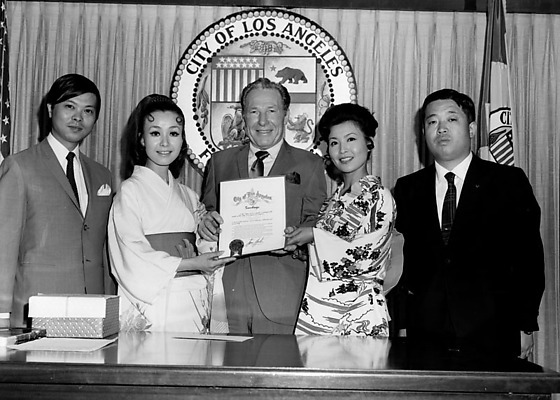 Los Angeles Mayor Sam Yorty presents a certificate of greeting to Japanese singer Mari Sono at Los Angeles City Hall, Los Angeles, California, June 20, 1970. Mayor Yorty, smiling Caucasian man in light colored suit, stands in center holding certificate, flanked by two Japanese women in kimono and two men in suits. Los Angeles City emblem on curtained wall flanked by American and California flags. Desk in foreground. Typed on original envelope: Sono Mari -- Japanese Singer w/Mayor Yorty.